Maebashi International Kindergarten (MIK) is a unique learning center where a staff of fully licensed Japanese and Foreign teachers work together to teach students of diverse learning abilities and cultural backgrounds. As the world continues to be affected by growing Globalization, Japan has an ever-increasing need to interact with foreign countries. With this expansion, English has become the primary language for businesses across the globe. Conversational English is becoming ever more important, but the English that is taught in schools and businesses is not useful in the global economy and will cause problems in the future. After looking at many aspects of this problem, it is clear that the most important thing to do is to build an interest in English and basic conversational skills during early childhood. Maebashi International Kindergarten (MIK) focuses on creating a learning environment where children can experience the English language and culture in a fun and natural way before their primary and secondary school years, thus taking the first step in their English education, allowing them to approach English interactions with confidence and enthusiasm. 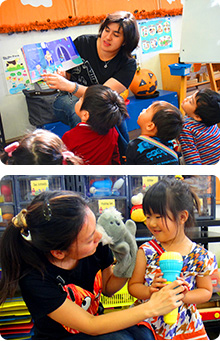 An Immersion Program is an education and daycare system where English and Japanese are used approximately the same amount in the classroom, with the Native English teacher using English, and the Japanese teachers using Japanese for about a 50/50 mix. This system of using two languages simultaneously will allow the students to become comfortable with both languages and be open to other languages and cultures they may interact with in the future. This motto of “I can do it myself!” focuses on not over teaching the children, but rather allowing them to think for themselves. Teaching is focused on showing students how to think first and then attempt to solve problems on their own. This skill allows them to voluntarily decide during class and play time how to interact appropriately with their peers socially, emotionally, and physically, giving them the tools they need to develop into fine young men and women. Additionally, craft time (building and drawing art) is used to foster the student’s creative expression. Early childhood education focuses on developing student’s initiative, sense of possibility, and personality, so that they happily believe they can do anything, and have the courage to follow their future dreams. 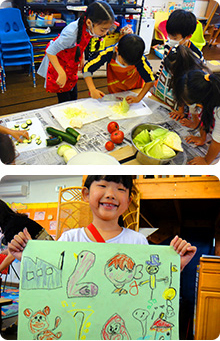 Maebashi International Kindergarten follows an original program focusing on “Theme Work”. Every week, various themes are used during class time and playtime. (For example: Space, Dinosaurs, Food, World Stories, etc.…). These themes are chosen based on the interests of the students. Since MIK has adopted this program, the teachers are able to nurture the curiosity of the students while helping them to expand their interests. MIK has students that range from the ages of 2 to 6 years old. With this range of ages (5 years) MIK adopted a two-group system called Family Grouping. A Family Grouping system allows for an environment where children of different ages can work closely together to benefit one another. The younger students are able to observe their older peers learning and expanding on their own abilities, while the older students can assist the younger students in their development. 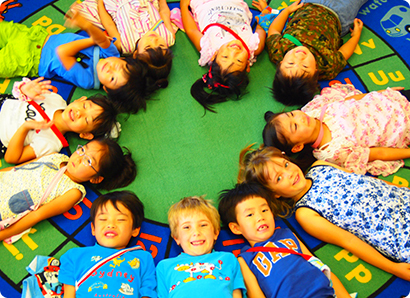 This system nurtures the student’s sense of cooperation and compassion as they grow up. 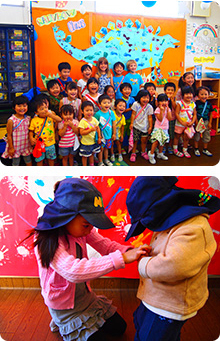 At Maebashi International Kindergarten, the teachers strive to offer a special educational experience for our students. In this international society, the children have unlimited possibilities and choices in their futures, and the staff of MIK hopes to see the students smiling faces as they reach for their dreams.